White House Says It Will No Longer Release Visitor Logs To The Public : The Two-Way Reversing Obama administration policy, the White House cites "grave national security risks." Watchdog groups have criticized the Trump administration's decision as a move against transparency. The Trump administration says that owing to security and privacy concerns, it has changed the previous administration's policy of releasing the names of White House visitors. The Trump administration says it will not make public the names of those visiting the White House, reversing the Obama administration's policy. 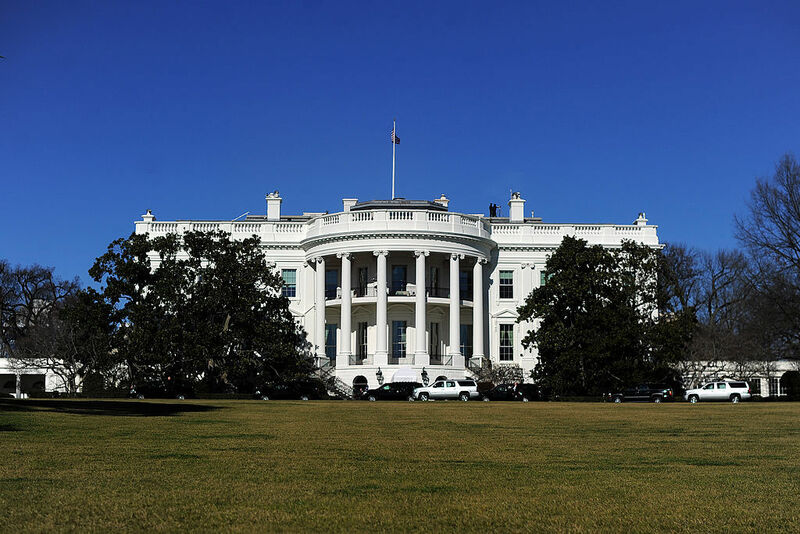 White House communications director Michael Dubke said in a statement that the decision was due to the "the grave national security risks and privacy concerns of the hundreds of thousands of visitors annually," NPR's Scott Horsley reports. Dubke added that the logs would be disclosed "as outlined under the Freedom of Information Act." FOIA does not apply to the president or his immediate staff. Watchdog groups immediately criticized the decision, with Citizens for Responsibility and Ethics in Washington calling it a "massive step away from transparency." "The only reasonable conclusion is to believe the Trump administration has many things it is trying to hide," the American Civil Liberties Union said in a statement, also referencing the administration's relationship with the media. Former President Barack Obama did not pledge to release these records until eight months into his presidency. "For the first time in history, records of White House visitors will be made available to the public on an ongoing basis," Obama stated at the time, calling it a sign of the openness and transparency of his administration. The Washington Post says the Obama White House released the names of "nearly 6 million lobbyists and other visitors." At the same time, the Center for Public Integrity has questioned the completeness of the Obama records, as The Two-Way reported. "The policy permitted some exceptions to disclosure, including purely private visits to the Obama family, such as friends arriving for sleepovers with the president's school-age daughters. The Obama White House also maintained the prerogative not to release records of particularly 'sensitive' meetings, such as interviews with potential Supreme Court nominees." It's worth noting that during Obama's presidency, Trump questioned his transparency and once wondered whether Obama might be "hiding something" by not releasing records. CREW said it filed a lawsuit this week against the Trump administration "to make sure they would continue to release the logs." It says the National Security Archive and the Knight First Amendment Institute at Columbia University are also part of the lawsuit. The White House is not the only meeting location that watchdog groups are concerned about. This week, CREW and other groups also asked a federal court in New York "to include visitor logs for Mar-a-Lago and Trump's Manhattan residence, Trump Tower," NPR's Greg Allen reported. CREW also filed lawsuits against the Obama administration before it said it would release the meeting details, as we have reported. The Trump White House said it will shutter a section of the White House website launched by the Obama White House as an effort to streamline transparency for the public, NPR's Domenico Montanaro reported. The Trump White House calls it "duplicative." One recent visitor to White House grounds recently resulted in a scandal: House Intelligence Chairman Devin Nunes, who went there last month to view classified information. "There was outcry over how he briefed the president and the press but did not share the data with his colleagues on the committee," The Two-Way reported. Nunes later announced that he has temporarily stepped aside from his committee's probe into Russian meddling in the 2016 election.